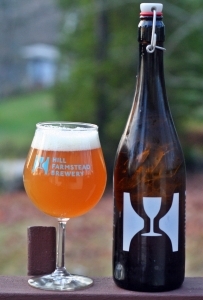 Double Galaxy marks the 41st beer review for me from Hill Farmstead. That doesn’t include the many bottles I have in my cellar that have yet to be opened. Because of this it is unusual for me to arrive at Hill Farmstead and find a beer on that I have not already tried and reviewed. During last week’s visit they had Double Galaxy which somehow had eluded me until now. Double Galaxy looks like so many other Hill Farmstead beers with an unfiltered orange and bright white head. Aroma is more tropical than citrus and only slightly dank. Taste follows with loads of crisp, fresh hops. Only slightly bitter and no noticeable alcohol even at almost 8% ABV. I had this beer the day after enjoying Double Citra and I have to say I enjoyed Double Galaxy a bit more than Double Citra which surprised me. Both exceptional beers but I give the slight edge to Galaxy. Brewers Description: An American Imperial Pale Ale bittered, flavored, and dry hopped exclusively with Galaxy hops from Australia.